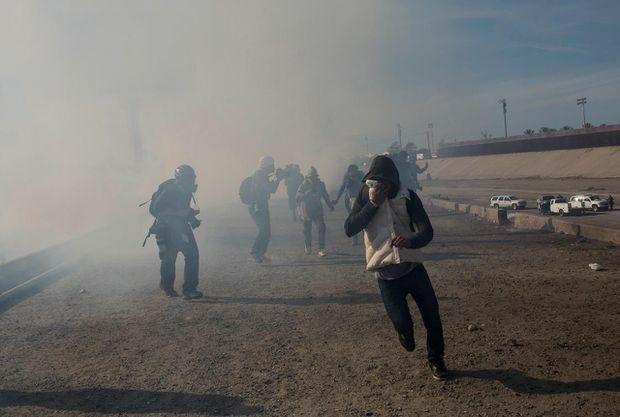 On Sunday, U.S. agents shot canisters of tear gas at migrants attempting to cross the southern border from Tijuana, Mexico. Photographs of women and children crying as they fled clouds of gas now join the disturbing images of migrants in cages, toddlers wailing behind chain-link fences, families separated by armed guards with little hope of reuniting. This chaos, and the mounting pain in the name of the American flag, has made one thing painfully obvious: the United States is on the wrong side of history. That unfortunate truth has become more evident since Donald Trump took the oath of office and steered the country by its worst instincts. The unvarnished bigotry of his campaign and eventually his administration peeled back the thin veneer hiding our ugliest prejudices. We are in very deep, very dark waters. Whether it was the prejudiced Muslim travel ban, the persecution of transgender Americans, the sowing of racial animus, his inspiration of neo-Nazis and murderous assassins or his partnering with homicidal despots, the sad truth is that, no matter how we want to deny it or wish it wasn’t so, this is who we are now. We are a country that enjoys closer relations to Russia, North Korea, and Saudi Arabia than our traditional allies in Europe and NATO. It’s in these vicious pacts with despots that the true nature of the problem crystallizes. The collective memory of this nation – in fact, the identity we Americans have come to cherish – is predicated on iconic scenes like Franklin D. Roosevelt beside Winston Churchill and Ronald Reagan commanding Mikhail Gorbachev to tear down the Berlin Wall. These are moments that came to define America in the eyes of the world as the standard-bearer and guardian of freedom and democracy. But now? We see the President gushing over Vladimir Putin, a man who interfered on his behalf in the 2016 presidential election, a man whose critics are regularly murdered. We watch Mr. Trump legitimizing Kim Jong-un, an insane dictator who lords over his dystopian nightmare of a country with an iron fist. We witness Mr. Trump running exhaustive interference for the Saudis after the brutal murder and dismemberment of a journalist. We listen to Mr. Trump salivating over the state-run propagandist media of tyrannical regimes and floating the possibility of cancelling elections or ignoring the term limits of his office. Though Americans pride ourselves on our presumed identities as the heroes of history – the good guys on the world stage – we have, under the toxic direction of Mr. Trump, become the villains of world affairs. We have ceded all leadership and stewardship in the name of throwing our lot in with the most despicable and corrupt countries on the planet, and on every meaningful issue of the day, we find new and disappointing ways to fail the test of our times. With every development in the world, with every controversy and every crisis, the only thing certain in this uncertain time is that our leadership will find a way to position us with the unethical and the morally compromised. We don’t lead on climate change. We wage never-ending wars that destabilize entire regions, and our weapons regularly kill innocent civilians. We ignore the well-being of our own citizens, pollute their air and their food, rob them of educations and their pursuit of happiness, lock them up and bleed them dry via the profit machine of mass incarceration. We can no longer even lay superficial claim to being leaders on human rights, as we’ve given a blank cheque to homicidal dictators. We can’t even champion democracy, as our own elections are swayed by disenfranchisement efforts targeted at minority populations. Make no mistake – this is not an overnight development. For decades, the United States has savaged its own democracy while toppling elected governments and interfering in other nations’ affairs. We’ve invaded sovereign states, killed untold numbers of innocent victims and committed unthinkable crimes. This wasn’t so much a slippery slope as a long and predictable path that led to Donald Trump. The only means of a course correction now is recognizing the awful reality of the situation. Americans have long been in denial of our contradictions and our horrible hypocrisies – of which there are many – but there’s simply no denying the truth any more. In spite of us, the rest of the world has already come around to recognize the reality. After watching Donald Trump continually cozy up to Mr. Putin and disregard existing treaties, Germany’s Angela Merkel and France’s Emmanuel Macron have already spoken out to promote a world order in which liberal democracies no longer have to depend on America to the do the right thing. If we are to reverse this trend and reclaim our place as world leaders, we have to face facts and admit we’ve lost the moral high ground. It’s as recognizable as the terror on the faces of immigrants being gassed at the border. We’re the bad guys now.